Limited mobility is a problem many seniors face, and research shows it can bring considerable mental and physical consequences. Some risk factors among older adults with limited mobility include depression, memory loss, and diminished cognitive skills. If you or a loved one has lost some mobility, that doesn’t mean you have to give up the activities you enjoy. There’s a wide range of hobbies and activities that can help older adults with lower mobility stay mentally sharp, physically active, and with a fuller social calendar. The five following ideas are great places to start. Numerous studies over the years show that reading can improve brain function and benefit the mind in ways that remain with you for years. For seniors, reading regularly is also an important way to stay up-to-date with what's happening in the world and to learn new things. 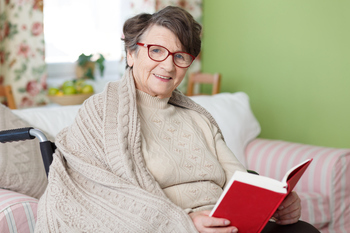 Regardless of their mobility level, your loved one can also take their love of reading to the next level by joining a book club. This combines the cognitive advantages of reading with social benefits: giving your loved one the chance to interact with like-minded-people and share their ideas, opinions, and a sense of creativity and freedom. Limited mobility doesn't mean that exercise is off the table. There are many exercises you or your loved one can still can do, such as water aerobics and other aqua exercises. The benefits of water aerobics can include improved flexibility, cardiovascular health, decreased body fat, rehabilitation for injury or illnessmand improved strength. Exercising in the water also provides a low impact workout that's easy on the joints, which is key for seniors with arthritis or other chronic joint pain. Another great way for an older adult at any mobility level to challenge and enrich their mind is learning a new language. For many, in fact, it's one of the most challenging, yet rewarding, things that they've done. Research shows that switching between two languages activates parts of the brain used for completing tasks and getting things done. But that doesn’t mean it's all hard work, especially with the wide availability of online language learning tools. For example, Fluentu is a website that teaches users a new language using videos from the real world. Its founders believe that people learn best through engaging experiences, such as movies, that reinforce words. They're experiences that help prevent learners from giving up. And free online tool Duolingo breaks language learning into lessons in which users earn points for correct answers, take quizzes and receive in-lesson grading, helping them stay motivated to continue learning on a daily basis. Improved strength - A healthy body helps seniors better withstand falls and injuries. Better flexibility - Chair yoga will help you do activities that weren't possible previously because of flexibility issues. Reduced stress and improved mental clarity - Seniors often suffer from feelings of isolation and anxiety and chair yoga can help you or your loved one cope with both. It also leads to a greater sense of happiness and well being. Better pain management - Chair yoga helps people to cope with and manage their pain thanks to breath awareness and meditation that are at the core of the practice. Improved coordination - Chair yoga helps practitioners become more aware of their bodies and helps them coordinate their movements accurately. This can help seniors with mobility issues avoid potentially debilitating falls. The term “quilt” is used loosely in this case because the activity doesn't have to involve an actual quilt, but can be anything that keeps the fingers and hands moving. Fidget quilts may include zippers, ties, strings, closures, buttons, braids, different textures and much more. Working on a fidget quilt is a great way to keep your mind and body engaged, and doesn't require precise piecing and stitching. This can be especially beneficial for older adults with dementia.